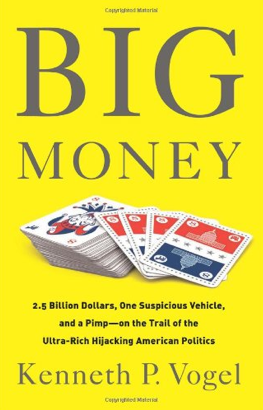 In book stores like Kindle and Nook today, find POLITICO Chief Investigative Reporter Kenneth P. Vogel’s latest BIG MONEY: 2.5 Billion Dollars, One Suspicious Vehicle, and a Pimp—on the Trail of the Ultra-Rich Hijacking American Politics, which explores the finances behind the American political system. Similar to Mark Leibovich’s This Town, which exposed DC as the “nexus of big politics, big money, big media, and big vanity,” Vogel explains how just a handful of the rich dominate the political landscape. On Friday, the POLITICO magazine cover story offered an excerpt from the book. While we’ve yet to receive our copy (it is en route), the book’s publisher – PublicAffairs – shared with us some of Big Money’s major themes. More on them after the jump. 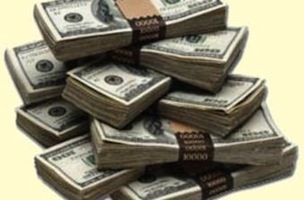 Major themes from BIG MONEY: 2.5 Billion Dollars, One Suspicious Vehicle, and a Pimp—on the Trail of the Ultra-Rich Hijacking American Politics, via PublicAffairs.